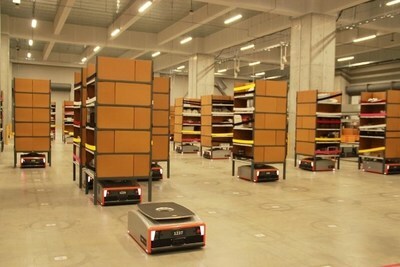 HANNOVER, Germany, Sept. 6, 2018 /PRNewswire/ -- GreyOrange™, the global leader in AI-powered robotics systems for flexible automation across fulfillment centers in supply chain, has announced US$140 million in Series C funding, marking the largest round ever raised by an industrial robotics company. "As a global investor focused on emerging category leaders, Mithril is proud to partner with the GreyOrange team to advance our shared vision of a universal platform for flexible automation. As online and offline channels converge across a wide range of industries, we are excited to support robotic solutions that thoughtfully bridge the world of bits and the world of atoms, driving better health, safety and efficiency for workers and customers alike," said Ajay Royan, co-founder and Managing General Partner of Mithril Capital. Binny Bansal, Flipkart co-founder and Group CEO said, "As an entrepreneur myself, I have closely followed how Samay and Akash have built and grown GreyOrange to become an international technology company with customers across the world. I look forward to supporting and witnessing the new phase of their growth. The team will build on its strengths, especially in AI and machine learning, to launch new generation products for flexible automation." Samay Kohli, Co-Founder and CEO, GreyOrange said, "We are fortunate to have an experienced management team and investors with a common vision to build the next generation of flexible supply chain systems. Having a veteran board member and strategist like Ajay Royan join the board will help fulfill that vision faster. Fundraising events are important milestones in a company's journey, and for GreyOrange, the funds will allow us to continue to invest in our R&D and supply chain to maintain our market-leading position." He added, "GreyOrange offers robotics technology for operating flexible automated warehouses and has the largest market share globally in this space. We've grown rapidly in recent years and will accelerate the expansion of our regional teams, especially within the U.S. We strongly believe in thinking global but operating local. As we continue to invest heavily in the R&D of our products, we will solve new problems for our customers and help transform the industry." The goods-to-person Butler™, an AI-enabled autonomous robot, optimizes the supply chain process from inventory storage and replenishment to order picking. The Butler PickPal™ combines AI and Machine Vision to revolutionize automated fulfilment, working in tandem with the Butler to accelerate multi-fold the pick process in fulfillment centers.